This useful desktop organizer will have your school logo on one side and your photo on the other. 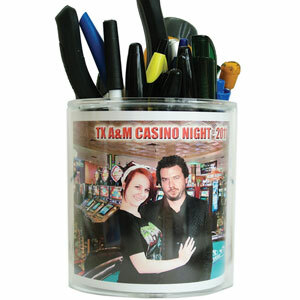 We shoot, print and insert your photo into this jumbo durable acrylic cup holder in minutes. Holds dozens of pens and office tools. Great gift for new students on campus. School must provide one volunteer, a covered workspace (indoor/tent/canopy), a table, 2 chairs, bottled water, and access to a power outlet. If nearby parking can be arranged that would be appreciated as well. Want to talk with us about Photo Desk Organizers?